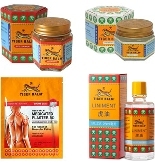 Ointment used by many professionals to relieve pain due to the training. This ointment is well suited for contact sports. Available in 100 gram tube. Greaseless, stainless, vanishing cream base for relief of muscular aches, arthritic and rheumatic pain, strains and sprains. This unique massage cream is used by Thai boxers, kick boxers and athletes worldwide. This is a must for any training session or competition, provided the heat to relax muscles before or after any of exercise. Many practitioners who currently use this product all know that it is a necessity mainly fight against serious. Just to rub / massage your muscles warm up and before long the muscles and open your nostrils with that distinct smell, and you're ready for action. This product can be used as a tool to heat or simply apply to those tired muscles with or slightly injured. This ointment massage has the same characteristics as the liniment. It is also very famous in Thailand to be applied to athletes practicing Thai boxing. It is applied in massage to the muscles before training to allow the heating of the latter. It can also be applied after training to relax tired muscles. - Use only in external, on a skin. - Don't use on children below 3 years. - Don't apply around eyes, near wounds or on mucous membranes. - Store in dry room below 30°.